A black chalk, pen and ink and wash drawing of a bust of Isaac Newton, resting on a classical sarcophagus supported by Father Time, and two female allegorical figures representing History and Astronomy. 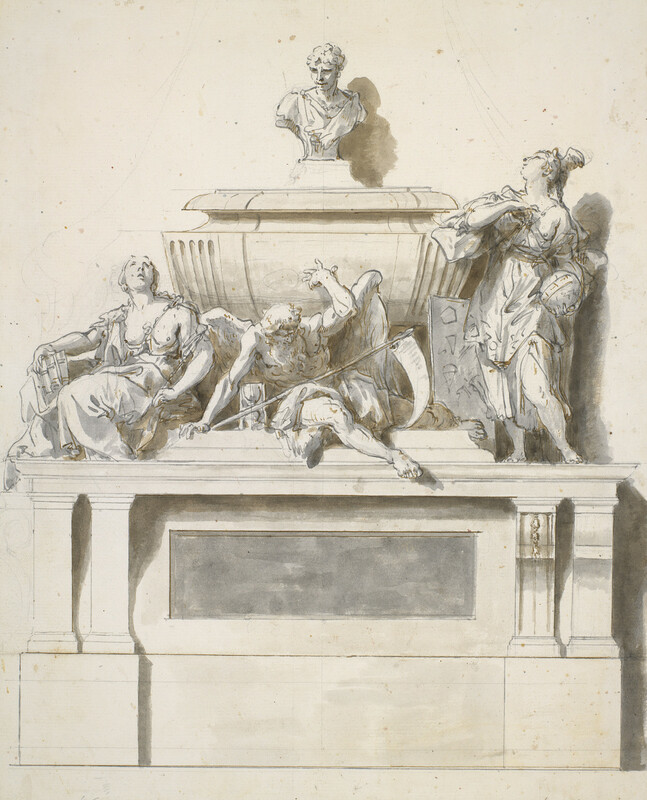 The English mathematician and physicist Newton died in 1727, and this drawing is a study for a proposed monument probably dating shortly afterwards. Joseph Smith, Ricci's patron, had a keen interested in Newton, and published at least two books connected with his work via the Pasquali Press. Smith also commissioned a gouache of the same subject by Marco Ricci (RCIN 400585) which is dated 1728. The monument is similar to the tomb by the sculptor Michael Rysbrack to the designs of William Kent in Westminster Abbey that was not completed until 1731. Smith was in contact with John Conduitt, husband of Newton's niece, who commissioned the Rysbrack tomb and it is possible that he obtained preliminary sketches from him that he passed on to the Riccis. Smith was also well aware of the project embarked upon by the impresario and art dealer Owen McSwinny for a series of twenty-four allegorical tombs in celebration of great English men since the Revolution of 1688. Newton had among the highest reputations of the period, his study of optics of interest to painters, and his clarity of thought linking him to the great contemporary philosopher John Locke. McSwinny's project was launched from Smith's house in Venice with Lord March in the 1720s; Sebastiano and Marco Ricci provided two paintings for the series, those for the Duke of Devonshire and Sir Cloudesley Shovel. The painting of Newton was completed by G.B. Pittoni and the brothers Domenico and Giuseppe Valeriani.